This is a variation of a dish popular in the Middle East, where it is also prepared with brown or white rice. I've added mushrooms for a distinctly American touch. It's a recipe I also vary with frequency, adding tidbits of cooked broccoli, carrots, or peas and even pieces of leftover meat or poultry. Depending on the kind of meal I am serving, I use chicken or beef stock instead of water. Place the lentils and water or stock in a saucepan and bring to a boil over high heat. Turn the heat to low, cover the pan, and cook for 18 to 20 minutes. Add the bulgur wheat and stir gently. Cover the pan and cook for another 5 minutes or until the bulgur and lentils are tender and all the liquid has been absorbed. Remove the pan from the heat and let rest for 5 minutes. While the bulgur and lentils are cooking, heat 4 tablespoons olive oil in a sauté pan over medium-high heat. Add the onions and cook, stirring occasionally, for about 10 minutes or until they begin to brown. Add the mushrooms and cook for another 6 to 8 minutes or until the vegetables are golden brown. Add the parsley and stir. Transfer the bulgur and lentils to a bowl. Add about 2 tablespoons olive oil (a bit more if the grains seem dry) and mix. Season to taste with salt and pepper. 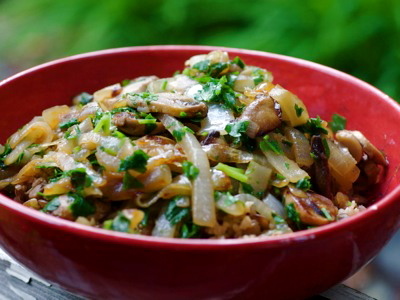 Top with the sautéed onions and mushrooms and stir gently to incorporate some into the grain mixture.